Perfectly adapted implant components for first-class implantology results. Simon Jakubka, Application Engineer at FOLLOW-ME!, explains the advantages of Dental Hybrid Manufacturing. The FOLLOW-ME! Team enjoyed a wonderful Christmas Party in Munich. As is tradition, the Engineer of the Year Award was presented at the party. The 2018 Engineer of the Year Award went to Gerhard Seidel, Application Engineer, FOLLOW-ME! Head Office. Gerhard began working together with FOLLOW-ME! in 2013 and has been a permanent team member since 2016. He consistently impresses our customers and dealers with his friendly manner and competence. He visits customers, creates databases, holds training sessions and assists with customer projects. 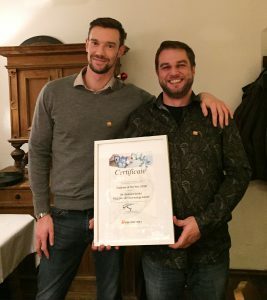 We are very thankful to have Gerhard as part of our team and look forward to working with him on many exciting projects in 2019.